Let’s study and see the reasons and explanation of why the sunset is red in color: Light moves in a straight line until it is interfered with(gas molecule, dust, or anything else). What happens to that light depends on the wavelength of the light and size of the particle. After light hits a gas molecule some of it may get absorbed. Later, the molecule radiates the light in a different direction. The color that is radiated is the same color that was absorbed. The different colors of light are affected differently. All of the colors can be absorbed, but the higher frequencies (blues) are absorbed more often than the lower frequencies (reds). This process is called Rayleigh scattering. Within the visible range of light, red light waves are scattered the least by atmospheric gas molecules. 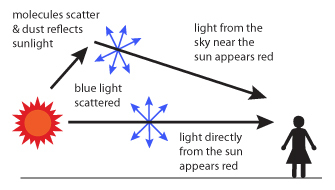 So at sunrise and sunset, when the sunlight travels a long path through the atmosphere to reach our eyes, the blue light has been mostly removed, leaving mostly red and yellow light remaining. At sunset, light must travel farther through the atmosphere before it gets to you, so more of it is reflected and scattered and the sun appears dimmer. The color of the sun itself appears to change, first to orange and then to red because even more of the short wavelength blues and greens are now scattered and only the longer wavelength (reds, oranges) are left to be seen. During sunset hours, the light passing through our atmosphere to our eyes tends to be most concentrated with red and orange frequencies of light. For this reason, the sunsets have a reddish-orange hue. The effect of a red sunset becomes more pronounced if the atmosphere contains more and more particles. The presence of sulfur aerosols (emitted as an industrial pollutant and by volcanic activity) in our atmosphere contributes to some magnificent sunsets (and some very serious environmental problems). Why the sunset is red in color? As the sun begins to set, it goes further away from you. The light must travel a longer path in the lower atmosphere to get to you. The lower atmosphere contains particles such as aerosols, dust and water droplets. These particles reflect the light that hits them, therefore you see more red.